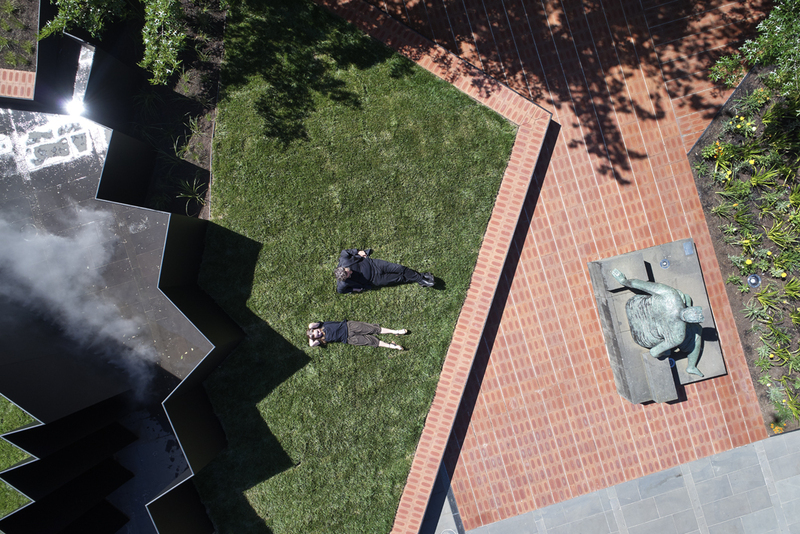 The 2018 National Gallery of Victoria (NGV) Architecture Commission by Melbourne architecture practice MUIR and landscape architecture studio OPENWORK has been unveiled at the NGV International. 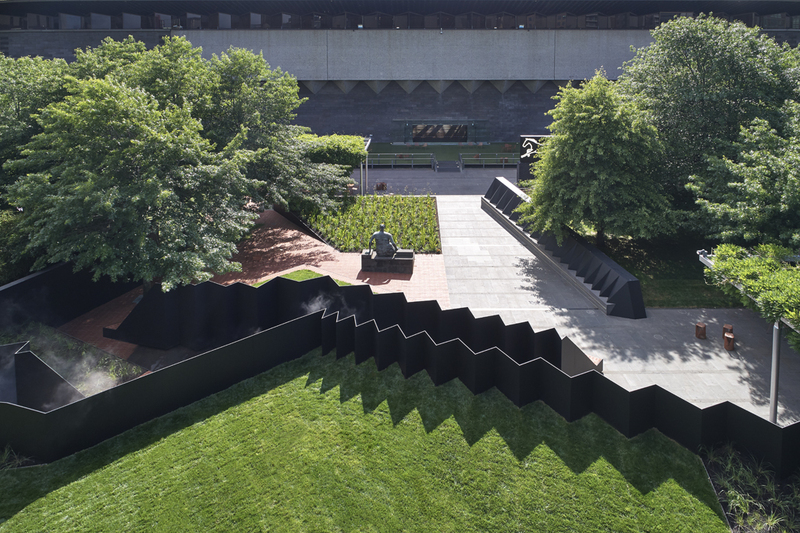 Titled Doubleground the installation, which is inspired by architectural elements of Sir Roy Grounds’ 1968 building, features tilted embankments and chasm-like passageways. 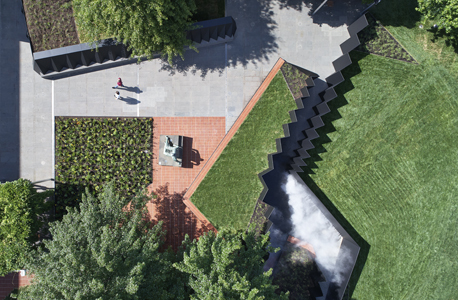 Architect Amy Muir and landscape architect Mark Jacques drew from memories of visiting the NGV in their childhood to create the structure, which is built around a canyon-like corridor that references the triangular patterns of the NGV’s façade and glass wall of the Great Hall. It also features a decking area that recalls Grounds’ timber design for the Gallery foyer and a bamboo garden inspired by the building’s original Bamboo Court courtyard. 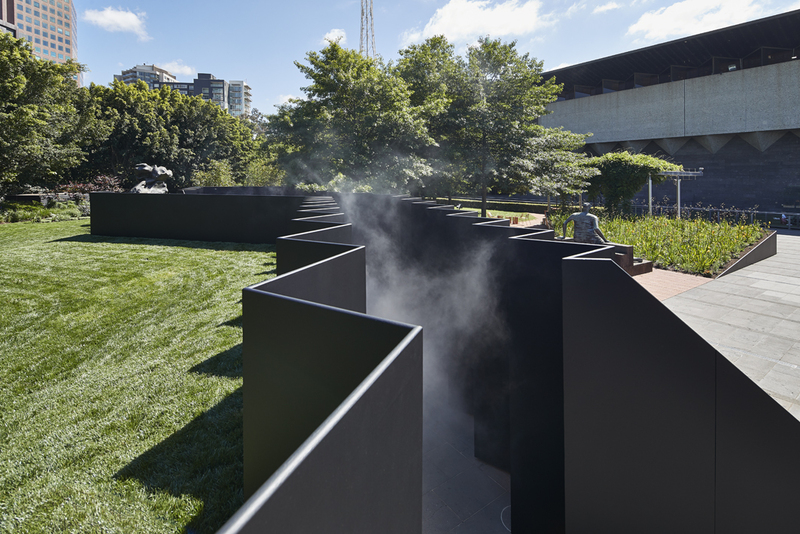 Occurring annually, the NGV Architecture Commission is an open national competition, which invites architects to create a site-specific work of temporary architecture, activating the NGV’s Grollo Equiset Garden. The competition has two stages, an anonymous first stage after which up to five projects are shortlisted during a live presentation. 2018 saw 73 entries from across Australia. The shortlisted teams were presented to the competition jury and assessed in May 2018. The NGV Architecture Commission will be on display at NGV International from November 2018 to April 2019. Entry is free.